BOTOX® Cosmetic is a safe and natural, purified protein. When BOTOX® is injected into a muscle, the muscle relaxes and overlying facial wrinkles will soften. Additionally, where muscles pull down the eyebrows, BOTOX® injections allow the brows to elevate. This is commonly referred to as a “chemical brow lift.” At Parva Plastic Surgery in Northern Virginia, with our advanced injection techniques, we map the face and administer the appropriate doses of BOTOX® for your specific facial muscle requirements to give you optimal results. This 35 year-old young lady is seen demonstrating extreme muscle activity when actively lifting her brows, which also results in the lines that form across the forehead. 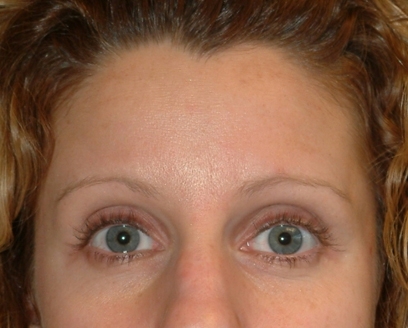 One month after receiving 16 units of Botox, her forehead is smooth and relaxed. What can I expect during a BOTOX® consultation? During your complimentary consultation at Parva Plastic Surgery, we take pride in defining your individual needs and cosmetic goals. Through mapping of the face, we will determine your facial muscular movements that cause noticeable lines and wrinkles, directing accurate dosing of BOTOX® and advanced placement necessary to accomplish a precise aesthetic outcome. We will focus on learning about your individual needs and cosmetic goals. We strive to provide a comfortable treatment lasting 15 minutes or less. Appropriate doses of BOTOX® Cosmetic are administered directly into the overactive muscles that cause dynamic lines and wrinkles to form, giving the skin a smoother, more refreshed appearance. Throughout the process, you will feel confident and well informed about your treatment. What can I expect after BOTOX® injections? Unlike surgery, BOTOX® Cosmetic is fast, simple and minimally invasive, with no downtime or recovery. This non-surgical cosmetic enhancement has minimal and/or brief discomfort. Once the injection is complete, there is usually no discomfort. Most people return directly to work or normal activity following treatment. It is advised to refrain from heavy workouts for 24 hours and avoid massage or manipulation of the injected areas for 24 hours as well. Muscle relaxation of BOTOX® may take up to 2 weeks to take effect, however our patients often report looking more natural and relaxed within a few days. The effects of BOTOX® Cosmetic generally last 3-4 months. Parva Plastic Surgery has been honored with Black Diamond status by Allergan. Black Diamond recipients comprise of only 1% of all the practices in the nation. Black Diamond practices are recognized as the top providers of Natrelle® Breast Implants, BOTOX®, Juvederm®, Latisse® and SkinMedica® skin care products. This distinction signifies the high number of these treatments performed in our Leesburg office. Our patients can feel confident in the high level of expertise and experience provided during their treatments. Due to our patients’ continued loyalty and referrals we were able to achieve this honor. Thank you for your continued trust! We also accept members of the Allergan’s Brilliant Distinctions® program. The Brilliant Distinctions® program gives our patients points every time they are treated with breast implants, BOTOX® Cosmetic, JUVÉDERM®, Kybella® or LATISSE®. These points can be redeemed for savings on future treatments with those products or they can be donated to charities such as Dress for Success® or the Make-A-Wish Foundation®. As part of our ongoing commitment to you, we will be happy to enroll you in the Brilliant Distinctions program. Contact our practice for more information on our Platinum Plus Provider status and the Brilliant Distinctions® Program. Please contact Parva Plastic Surgery for your complimentary BOTOX® Cosmetic consultation with Dr. Parva, our board certified plastic surgeon, today. You’ve taken the first step in making the investment in rejuvenating how you look by having a Botox® treatment, so now it’s time to protect your investment. Skincare is an integral part of your aesthetic outcome. We are very happy to customize an appropriate skin care regimen to help you achieve the best possible outcome for you. SkinMedica® products remain scientifically proven in delivering improvements in tone, texture and reducing the visual signs of aging.